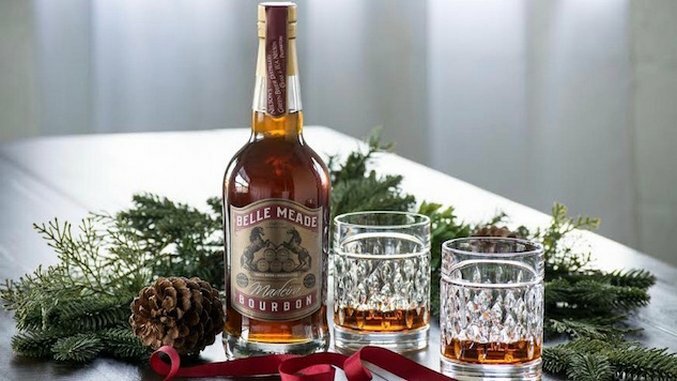 The holidays are fast approaching, so it’s time to consider some gift ideas for your booze-loving friends and family. It’s a safe bet that an excess of alcohol will be consumed during any typical holiday season, as families gather and political discourse and suppressed grievances fly across the dinner table. So here are some ideas to treat your loved ones – and yourself (why not?) – to some boozy gifts, from the affordable to the stupidly expensive, from bottles to accoutrements to breathalyzers. Happy holidays. Basil Hayden’s is a high rye bourbon that is part of Jim Beam’s Small Batch Collection, which also includes Knob Creek, Booker’s, and Baker’s. The brand has partnered with local artisans from cities across the country to create crafts that are supposed to complement and capture the spirit of the whiskey. These items are not cheap, but they are quite beautifully made. They also come in very limited numbers, but you can go to Huckberry’s Basil Hayden’s Holiday Shop to peruse the offerings. Choice selections include a Barman’s Candle Set from Austin’s Slow North ($75), a Sidekick Blanket and Holster from Los Angeles-based Railcar Fine Goods, and a beautiful canvas and leather Generous Traveler bag from Stanley & Sons out of NYC ($349). Bulleit Bourbon and Noble Denim have partnered to create something highly unusual that should appeal to both whiskey drinkers and Bruce Springsteen fans alike. Check out these jean jackets with bourbon barrel-aged collars. According to Noble, “the corduroy collar was aged in a freshly dumped Bulleit barrel for several weeks. Inside the barrels was the sludge left over from the bourbon aging process.” They added natural walnut dye and water which results in the collar being colored orange – and most likely smelling a little bit like whiskey. This may seem like an odd pick for a gift, sort of a passive-aggressive suggestion that the recipient has some issues with alcohol. But the AlcoMate Revo is actually a pretty useful little device that can help you make some good decisions as you inevitably drink just a little too much at all the holiday parties you are probably attending this season. It can also help you decide if it’s wise to drive to go pick up another bottle of booze if you are drinking by yourself at home, which you are also probably doing. Many home breathalyzers need to be recalibrated by the manufacturer, requiring you to send it in for servicing. With the AlcoMate, though, you just need to swap out the sensor with one of the provided replacements. Barrel-aged gin is nothing new, but it has mostly been relegated in America to the likes of the small-batch, “craft” producers. But the Brits are savvy to the magical mystery flavors that a barrel imparts as well, and Beefeater, the classic London dry gin, has its new edition of Burrough’s Reserve available now. Master distiller Desmond Payne created this gin, which has been aged in red and white Bordeaux barrels. The liquid is a light copper, with a soft oaky sweetness underlying the predominant juniper and lemon flavors. This can be used in a martini, but it’s best sipped on its own to truly enjoy it. Bourbon always – and I mean always – makes a good gift. There are two recent releases, one on the higher end and one with a friendly price tag to consider. On the cheaper side, Jim Beam is usually a solid bet, especially when you are dealing with expressions beyond the classic white label. The newest release is Double Oak. This bourbon is basically regular Jim Beam that is barreled for a second time in new charred American oak barrels, giving it a richer flavor and color than the original. It’s a good bourbon, and fans of white label will be impressed with the extra oak and vanilla flavors that really shine through. On the higher end of the spectrum, try Old Forester’s new 1920 Prohibition Style bourbon. At 110 proof, it packs a solid punch, making it great for cocktails. This is the third release in Old Forester’s Whiskey Row series, and is modeled after Prohibition era whiskey. It’s a lovely, flavorful bourbon with a little bit of spice and a long, smooth finish. There’s nothing worse than crappy tequila. But quality tequila will make you very happy. And Hornitos Black Barrel is affordable quality tequila that will specifically appeal to whiskey drinkers. Now, I know that tequila snobs may be up in arms and scoff at things like the use of diffusers in the production process… but I don’t care, this tequila tastes good. It’s aged for a year in American oak barrels, then finished for four months in charred oak barrels, and finally put in toasted oak barrels for another two months. The result is a whiskey-like tequila, with nice notes of oak and caramel that pop up through the agave base. If you’re looking to spend some more of your hard-earned cash, consider the 2016 Cuervo Reserva de la Familia. The box for this year’s release was designed by Jorge Mendez Blake, an artist from Guadalajara. The extra-anejo tequila is aged for at least three years in French limousine and American oak barrels, before being blended with a small amount of 30-year-old tequila. Nelson’s Green Brier Distillery is making Tennessee whiskey unlike any other distillery in the state, and the new Madeira Cask Finish would make a good gift for anyone interested in American whiskey. This is the third release in the Special Cask Finish Series, after the release of Sherry and Cognac Cask Finished Bourbons. For the Madeira Finish, six- and nine-year-old bourbon was married in Malmsey Madeira casks, resulting in a flavorful and well balanced whiskey that has lovely notes of honey, vanilla, and dried fruits. Dewar’s Blended Scotch and Billykirk have partnered up to create a new limited-edition leather messenger bag, said to be inspired by Dewar’s founder Tommy Dewar and his “pioneering and adventurer ways.” Only 100 bags were made, so this might be hard to get your hands on, and at $650 per bag these aren’t cheap. The leather was made to highlight its imperfections, making each bag distinct and unique. Each bag also has a pocket inside in which you can stash a bottle of whisky, making this a good gift for those who like to travel with their booze. Single malt scotch is a classic holiday gift, and this year there are some special releases from well-known brands that should definitely be considered. First up, the aspirational. You’ve certainly had Laphroaig before – it’s the one peaty scotch that sits behind every bar. Laphroaig 10 is a solid Islay malt, especially appealing to those who like big oily smoke flavors in their whisky. But the 25 and 30 Year Old expressions, while commanding hefty price tags, are something to try. The 25 is a cask strength whisky culled from both ex-bourbon and sherry casks. The 30 is a limited release offering, double matured in ex-bourbon barrels. Now let’s travel back to reality. Glen Grant has long been a favorite of mine. It’s a light and smooth, yet always interesting whisky. The newest expressions were released this past summer, and the 18 was subsequently named second best whisky of the year in Jim Murray’s Whisky Bible. The more affordable 12 is light and crisp and would make a great gift. It’s only available in several states at the moment, but will roll out nationally in 2017. The 18 is wonderful as well, and will undoubtedly be harder to find after Murray’s acclaim. Finally, the always-unusual Bruichladdich distillery has a well-priced gift set out now called the Wee Laddie. This includes three small bottles of the core expressions – the un-peated Classic, the locally sourced Islay Barley, and the smoky Port Charlotte. Don’t sleep on Irish whiskey. There are some interesting and aged expressions from which to choose these days that will satisfy any discerning whiskey drinker’s lust for brown spirits. The brand-new Lustau Edition from Redbreast is a good gift choice. This is the classic Redbreast finished in first-fill sherry butts for one year. It’s a lovely, sweetly floral whiskey with a nice, tart sherry undercurrent. Dublin’s Teeling has been making waves for some time now – it’s the first distillery to operate within the city limits in over a century. Actual distilling has just begun, so the brand continues to source and release excellent Irish whiskey. The newest and oldest release is the 24 Year Old, limited to just 1,000 bottles. The whiskey was matured in bourbon casks and Sauterne wine barrels, with just a hint of peated malt added during production. Looking for a gift that will satisfy both wine and whiskey enthusiasts? Check out Martell Blue Swift, a VSOP cognac that is finished in Kentucky bourbon casks. This is a deep but easy drinking cognac, full of fruit and vanilla flavors with a nice woody finish thanks to the bourbon barrels. Another American-inspired cognac out now is Bache-Gabrielsen’s American Oak. This cognac, only available in the U.S., is finished in new American Tennessee oak barrels for six months, affecting the liquid in a similar way as the Martell but with a sweeter flavor that has more raw wood on the nose. Rum is the new whiskey. Well, not really, rum is rum – and proudly so. But whiskey nerds are starting to pay more attention to this sometimes-brown, sometimes-clear spirit as delicious, aged expressions are being released. One of the newest is the potent O.F.T.D. Plantation Rum clocks in at a whopping 138 proof. (O.F.T.D. stands for “Old Fashioned Traditional Dark.”) The rum is the creation of nine experts, including writer and cocktail historian David Wondrich and Maison Ferrand’s Alexandre Gabriel. The group met and tasted and tasted and tasted over a week or so, until they came up with this particular overproof blend of rum. Put a bow on this bottle and give it to your favorite, swarthiest pirate – he or she will certainly be impressed.